What should you expect to eat and drink in Czech restaurants? Traditional Czech food is not exactly synonymous with healthy food; however, on the odd occasion you can make an exception! 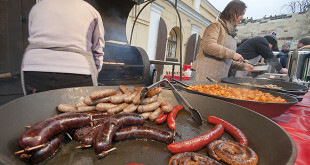 And do not forget that the food goes perfectly with the flavoursome Czech beer. From any local restaurant menu you can try dumplings (knedliky) with pork or beef and sauce. Knedliky is a traditional side dish made from wheat or potato flour, boiled as a ball in water, steamed and then sliced and served hot. Other good choices are duck, goulash, roast pork, fried cheese and venison. Czech restaurants should definitely be on your list while exploring Prague. Pubs and taverns (Pivnice a Hospody). 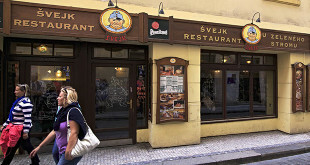 Specialize in draught beer and usually a small selection of traditional Czech dishes is available. Wine restaurants (Vinárny). Similar to restaurants but have a larger selection of wines. Cafes (Kavárny). For Czech snacks and cold dishes they are a good choice. Restaurace u Pinkasů, established in 1843, is known amongst local people as the 1st venue to offer Pilsner beer. Customers can sit in the authentic interior, at the front facing the street, or go out to the back garden, which is shaded by the St Mary Snow Church’s Gothic buttresses. Whilst the prices are simple, many of the staff can be rather rude (each day 09:00 to 24:00, 90CZK lunchtime menu, close to the foot of Wenceslas Square, in between New and Old Towns, Jungmannovo Náměstí 16, telephone: 221 111 150). Pivovarský Dům (“The Brew-house”), inside the New Town, on the corner of Lípová and Ječná, is well liked by local people due to the rare range of freshly made beer (wheat, fruit flavored and yeast), tasty traditional Czech meals, and a welcoming interior which combines present day and authentic (each day 11:00 to 23:00; during the evenings reservations are advised. Several beer mugs are sold; stroll from Wenceslas Square up Stěpánská street for ten minutes, or catch tram #22 for 2 stops to Lípová 15, from Národní to Stěpánská).